Flowers and sunshine meet to brighten up your garden with this unique solar powered glass flower stake. 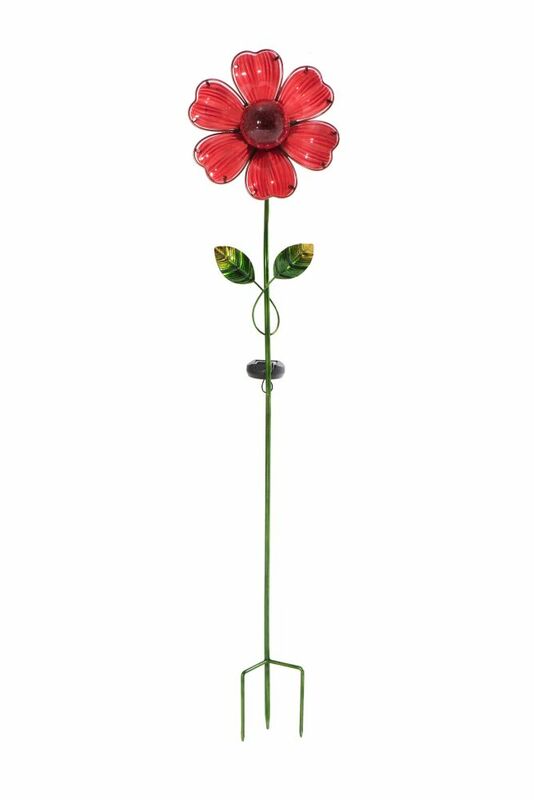 Standing just under 42 inches tall, the Sunjoy Red Glass Flower Garden Stake resembles a brilliant red daisy and features vibrant glass petals atop an iron stake. The daisy petals glow with variegated shades of red that lend depth and texture to the glass flower. Best of all, the center of this vivid piece features a clear glass LED solar ball that recharges during the day and illuminates beautifully once the sun goes down. Two green and yellow leaves gracefully wind around the sturdy iron stake and lend an extra touch of visual interest to the piece. Lovely and unique, this fun flower garden stake is sure to add plenty of beauty and style to your garden. Also available in Orange, Purple, Pink and Blue. The daisy petals glow with variegated shades of red that lend depth and texture to the glass flower. Best of all, the center of this vivid piece features a clear glass LED solar ball that recharges during the day and illuminates beautifully once the sun goes down. wo green and yellow leaves gracefully wind around the sturdy iron stake and lend an extra touch of visual interest to the piece. Bring the magic and good luck of a dragonfly into your own yard or garden with the Sunjoy Dragonfly Solar Garden Stake. Small baby blue blossoms and a curving green leafy vine delicately wind their way up this strikingly lovely garden stake. At the top of this unique garden decoration is the true star of this piece, a brilliant dragonfly poised to take flight. The dragonfly has a long blue tail and a pair of breathtaking cream colored wings that feature realistic veins, a deep navy blue border and lively polka dots. The friendly dragonfly also has a fun hidden secret. He hovers over a lovely glass globe that looks gorgeous during the day, but really shines at night. Thanks to this dragonfly garden stake's built in mini solar panel, the glass ball recharges during the day and illuminates once the sun goes down. When the ball lights up, it highlights the wings of the dragonfly and creates a truly whimsical effect for any outdoor setting. Glass Red Flower Garden Stake With Solar LED Flowers and sunshine meet to brighten up your garden with this unique solar powered glass flower stake. Standing just under 42 inches tall, the Sunjoy Red Glass Flower Garden Stake resembles a brilliant red daisy and features vibrant glass petals atop an iron stake. The daisy petals glow with variegated shades of red that lend depth and texture to the glass flower. Best of all, the center of this vivid piece features a clear glass LED solar ball that recharges during the day and illuminates beautifully once the sun goes down. Two green and yellow leaves gracefully wind around the sturdy iron stake and lend an extra touch of visual interest to the piece. Lovely and unique, this fun flower garden stake is sure to add plenty of beauty and style to your garden. Also available in Orange, Purple, Pink and Blue.